The effect is achieved with specially designed jacket patches. Nylon fabric is lasercut with artwork or lettering, and then placed over an electroluminescent panel. The fabric acts as a mask and is glued onto the EL panel, and the assembly is then attached to the back of the jacket with velcro. It’s a build that focuses on more than just a cool visual effect. The attention to detail pays off in robustness and usability – wires are neatly fed through the lining of the jacket, and special strain relief devices are used to avoid wires breaking off the EL panels. The extra effort means this is a jacket that can withstand real-world use, rather than falling apart in the middle of a posed photo shoot. Everything is well documented, from artwork creation to final assembly, so there’s no reason you can’t replicate this at home – and the final results are stunning. Our take is that electroluminescent technology is the way to go for retro and cyberpunk looks, but LEDs can be fun too – like in this high-powered Burning Man build. [nullpointr] wanted a backlit keyboard for his Asus Transformer Prime so that it would be a bit easier to use in low-light situations. He considered a few different options and ended up adding electroluminescent panels behind the keys. Those paying close attention might wonder why we called this a laptop in the title. Well, it’s a tablet with a keyboard dock and that’s a mouthful. This actually really helps to simplify the modifications because the motherboard and other bits are all in the screen portion of the device. EL panels are also a nice choice because you can cut them to size and they still function. With a bit of case work, three panels were made to fit side-by-side. The part that just isn’t going to make it in the original enclosure is the inverter that drives the panels. It’s the black box to the left. [nullpointr] added a USB-form-factor jack to the side of the case that allows the inverter to be disconnected quite easily. This way the Transformer Prime can still go with him on the road, it just won’t light up unless he also hauls around that add-on. Way way back we saw someone do this with fiber optics and an LED. Unfortunately that project link seems to be dead so we figure it’s about time someone revisited the concept. These geeky Superbowl decorations glow thanks to the EL panel hack which [Becky Stern] created. It’s almost impossible to make out in this image, but the EL panels have been applied to the surface of the helmet. On the San Francisco helmet you can just make out the black connector and cord at the bottom of the F.
El panels are a lot like EL wire (but they’re flat) in that the phosphors are excited when connected to a high voltage AC supply. You can cut the panels into shapes without a problem. The technique used here is to create a black vinyl mask to go over the top of the panel. This makes cutting the panel a lot easier. The mask sticker is made on a vinyl cutter. [Becky] is a master at using the vector tool as you can see in the video after the break. She outlined each team logo with paths to create a file which the cutter can use. From there it took several tries to get the sticker just right as the curve of the helmet distorts the logos just a bit. Once it was dialed in she stuck the vinyl on the El panel and cut around the perimeter. 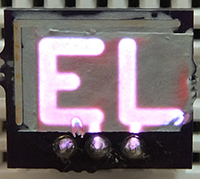 The Adafruit team sure loves to use electroluminescent accents. Way back in March [Ch00f] took on a for-hire project to make a suit that lights up to the music. He decided to build something based around a pulsating EL panel. He’s put a lot of time and tried of a few different techniques, but he finally has a working EL panel dimmer. This is a saga we’ve kept our eye on. The fall seems to have been good to him, after a failure using TRIACS he managed to adjust the brightness of some EL wire by messing with the current going to the driver’s oscillator. Standing on the shoulders of that success he designed the board seen above by getting serious about audio signal processing. There’s a microphone on the board which picks up sound which is then processed into a signal responsible for the brightness of the EL panel. There’s a demo video after the break, but you’ll want to dig into his article to get all the gritty details.